Please refer to our stock # T 1782 I-VII when inquiring. 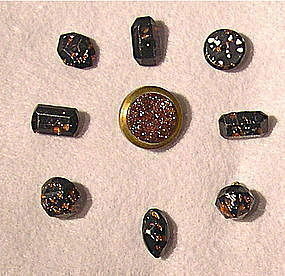 Antique vintage Victorian assorted collection of goldstone antique buttons. Some signed while others may be paperweight or Leo Poppers - please view all images for complete descriptions and dimensions. Also a circa 1880 Victorian 3 1/8" sash ornament C catch pin brooch with three deeply saturated sparkly copper aventurine art glass cabs and open work applied on pinched arts crafts oval base. Also view dozens of assorted buttons divided into various lots - includes an R. L & F Paris back, possible Leo Popper, paperweights, cobalt blue, ruby red, peach, pink, moon glow green, mottled, black & whites, cups, whistlers, metal backs, sew throughs, self shanks, metal shanks, faceted, etc. One even looks like it has real Gold shavings in it. All are poured. You are urged to examine each and every one to enjoy these small art glass wonders. Starting with the first nine piece goldstone on black group which includes 15/16" signed R. L. & F. Paris. View # 6 - 10 to see 36 incredibles, then the see them divided into four lots. You may purchase individuals starting at $3 each, or by any money saving collection, with a $59 minimum purchase. Please collect with confidence after reviewing the dozens of Trocadero verified testimonials, then view All Extreme close up images for more info, as all Qs will be answered here in lieu of email reply. Generous specials for multi piece order. UPDATE: The sash pin was originally listed for $126, but is now 59 because a small split was found at the upper right scroll application. Still a fabulous brooch with fabulous "aventurine" at a super fabulous price! Please view all 12 images to appreciate!